Hyperbole designed to get your attention? Well yes, but now that you’re here maybe you’ll learn a trick or technique that will make a future project just a little easier. Check the screws. Even slightly loose screws will allow the door to sag. If you find stripped screw holes, try longer screws that will bite into the jamb, or plug the hole (golf tees work great) and drill a new pilot hole before reinstalling the screw. Be sure to replace the screws with the appropriate diameter. If the head size is too large it will cause the hinge to bind. Shim the hinge. For years carpenters have realigned doors by shimming hinges with thin material like cardstock. Today we carry tapered plastic shims that can slide behind a loosened hinge so you don’t need to remove the hinge. Shimming involves trial and error. loosen a hinge, insert shims, test the swing of the door. Checking the gap between the door and the jamb might give you a clue as to which hinge to shim. Bend the hinges. This sounds more drastic than it is, but it does require care. Any pressure applied to a hinge will transfer to the screws and risk tearing them out. 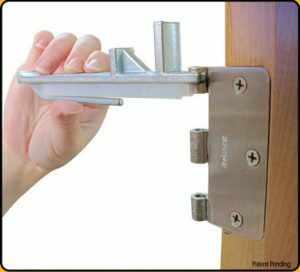 Bending or tweaking hinges is similar to shimming. You manipulate the hinge in order to return the door to plumb. This is done best with the door out of the opening. Bend hinge knuckles one at a time with an adjustable wrench, working from the top down and insert a hinge pin after each adjustment to assure alignment. Don’t try to bend a hinge by striking it with a hammer, you’re likely to strip the screw holes. We sell a cool tool called the Knuckle Bender that makes this job easy, and it also works great for removing hinge pins. See how it works. So there you go. Tame that door and put that old ceramic cat back on the shelf.